The Times published today a piece saying that they believe AB InBev would have presented London competitor SABMiller an offer for as much as GBP70Bn (USD100Bn+). For those not that into beer, we’re talking about a merger between 2 absolute giants ranking #1 and #2 in terms of Sales. AB InBev sells about $47Bn (25% est. market share) and SABMiller sells approx. $22Bn (12% est. market share). It’s also not the first time we hear about this possible merger. Both groups have been highly acquisitive in the past decades and, lately, with ambitions that seem a complete folly. A short background for AB InBev should give you an idea of what I’m talking about. In Brazil, Brahma merged with Antarctica to form AmBev in 1999, a rather large brewery (#5 worldwide as of 2004) then tightly controlled by Brazilians Jorge Paulo Lemann, Carlos Alberto Sicupira, Marcel Herrmann Telles (founders of 3G Capital). Brahma, itself, was Lemann, Sicupira and Telles’ first foray in beer after a successful sale of their investment bank to Credit Suisse. Meanwhile, Belgium-based Interbrew (itself fruit of a merger between Belgium’s largest breweries, Artois and Piedboeuf) acquired between 1987 and 1991 a bunch of Belgium breweries to build scale. Running out of options in Belgium, they started to look elsewhere: Hungary, Canada, Russia. 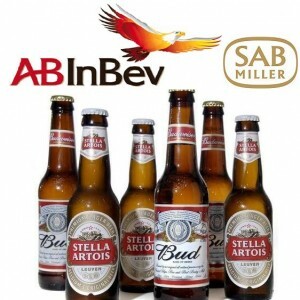 In 2004, Belgian Interbrew (#3) and Brazilian AmBev (#5) decided to jump ahead of the rest and merged into InBev, thus becoming the world’s largest brewery in deal valued at $11.5Bn. InBev, originally intended as a merger of equals with shared control of the company, quickly emerged as a Brazilian-dominated global leader. In subsequent years, the giant continued its acquisition spree, notably entering strong China’s juicy beer market with Fujian (#3 in China), consolidating in Canada, and strengthening its equity stake in LatAm-based Quinsa… but that was still not enough. Like a compulsive obese binge eater, the group still felt it had not enough so, in 2008, they went to the US and acquired, in a hostile takeover, Anheuser-Busch and dropping merely $52Bn for it in the largest all cash transaction of its time. Obviously, when you got to be the world’s largest beer maker and still went and bought one of your largest competitors (and, at the same time, one of the few iconic US brands), you need more than an investment in a local beverage company to make the news. Plus, what are you growth prospects, organically that is, at that level? You’re already covering the world with your hundreds of brands, advertising prospects are limited in most markets for the alcohol content, and consumers seem to have developed a taste for wine that can be scary if you’re a brewer, although beer is still the top choice. So what to do? Well, for starters, you could consider to buy Diageo to broaden your portafolio with key liquor brands or you could stick to what you know, look at the rankings and knock your neighboor’s door. If the transaction happens – regulatory rulings and shareholders’ decision are only 2 of the reasons it might not – AB InBev-SABMiller (S.AB InBev??) will account for more than 37% of beer money being spent worldwide and will own an impressive portfolio of iconic brands. Still, given AmBev’s reputation for cost-cutting and natural synergies when merging two groups of this size, there are valid reasons far beyond the market penetration perspective to complete such a merger. Alright, all this writing makes me thirsty for a Stella! Image Credits: RUNS ON BEER.